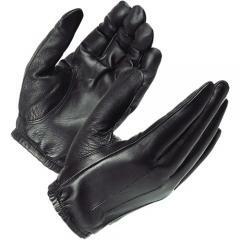 Hatch is known throughout the world as one of the leading manufacturers of police gloves. They have built this reputation by being able to supply high quality police gloves that suit specific requirements and meet rigorous demands. The SG20P Gloves are one of the best selling gloves for Law Enforcement of all time. They are manufactured with soft, durable cowhide leather that is "second-skin-thin". This allows for superior feel and dexterity while shooting, searching, cuffing or driving. The wrist length elasticized cuff provides a snug fit and will not interfere with your jacket cuff. Good gloves they fit and feel great. I don't know what I'd do without my gloves. I have nerve damage in my hands. If I try to pick up a 12 gal of water, milk etc., the pain in my fingers is excruciating. I came up with an idea about 5 years ago and have been using (Hatch SG20P XL) unlined leather cop gloves every day of my life, ever since. They compress my hands and fingers enough to minimize the pain almost entirely. Very comfortable and just what I wanted. I ordered a pair for my father as well. The price is much more reasonable that some of the other tactical gloves. I would buy them again and I would recommend them as well. These gloves are excellent for protecting hands from cold and foren objects but not good if your wanting to use them for a riding glove. Chose XL and they "fit like a glove". Great quality. I know something about sewing and these gloves are well made. Thumbs are a little long on me but other than that like they were made to order. Great value, better than I expected. Great gloves. I thought they'd be a little thinner. I purchased these gloves because I have nerve damage in both hands. One day I noticed that wearing gloves would stabilize my hands and reduce the pain from the damaged nerves and actually make my hands stronger. Regular gloves are normally loose and insulated. These are natural leather and even compress my fingers which hinders the pain. I recommend them very much to anyone with a problem like mine.